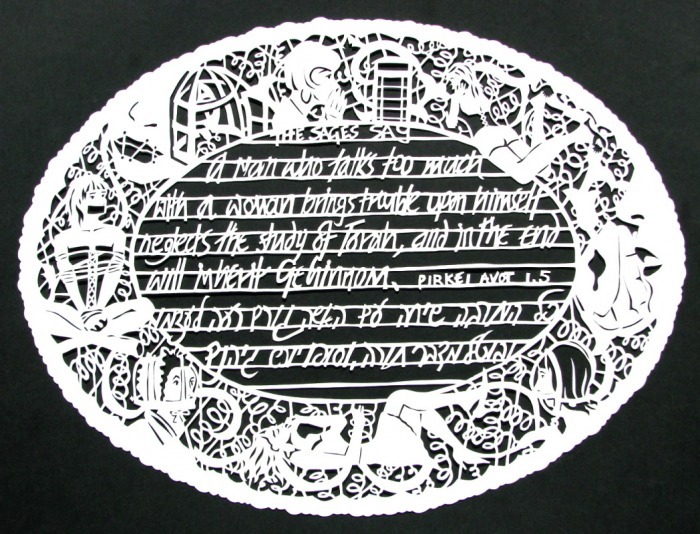 Jacqueline Nicholls’ beautiful paper-cut doilies, called The Ladies Guild Collection, take some of the more obviously misogynist passages of Jewish literature (like the one above) and turn them into works of art. The level of detail in the borders of these pieces is incredible. The entire collection is certainly worth exploring. Oh, and she’s drawing the entire Talmud one page at a time. Seriously, Jacquline Nicholls is a cool lady. Read her interview on Jewcy.